A VoIP toll free is a number assigned to companies or used by businesses and start with three digit numbers i.e 8 followed by 00 or 88 and so on. They are called toll free because there is no charge for callers. The cost is paid by the individual/company - owner of the number. Often corporate and medium sized firms subscribe to these type of numbers. However, with the advancement of IP based communication, almost anyone can have a VoIP toll free nowadays. Here are the most common toll free codes that start with 800, 844, 855, 866, 877 and 888. The '1-800' is one of the first number introduced in 1996. Costs: reduce costs, no equipment required when going hosted. Hosted VoIP solutions provides you ease of use and all your business phone system will be hosted at your providers premise. Coverage: You can cover as big market or area as you like with VoIP toll free. City, metro or national geography even world-wide markets (can have a number in different cities and countries). Vanity toll free - enhance your professional image by adding your company name on your toll-free number E.g 1-800-VoIP-PROV. Your clients will easily memorize the number. Announcement - greet and make an announce incoming calls then help your callers reach their desired extension number or person. 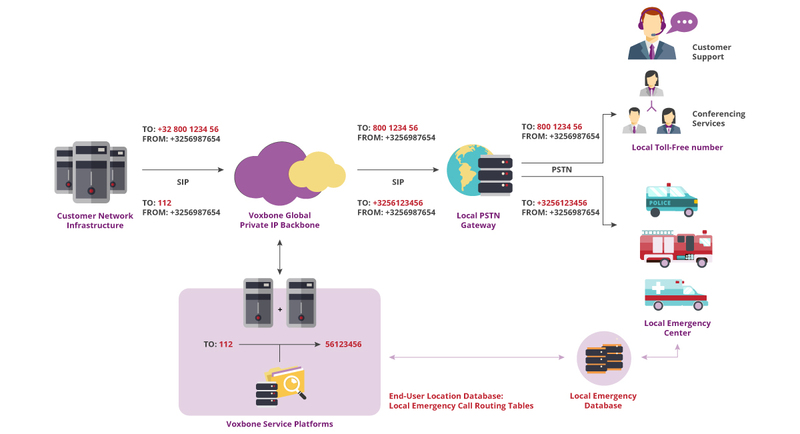 Routing - route calls to employee 1, 2, 3 etc.. a Office A, B or C.
Redirection - Direct incoming calls to whichever number or location you prefer.